Each year, since 2011, we have received a huge number of nominations for the miaList. We love to celebrate those outstanding and passionate individuals from all areas of the meetings, hospitality and events industry who go above and beyond the call of duty. 2018 has been no exception as we’ve seen an overwhelming influx of quality submissions. This year’s sought-after miaList features 10 names as well as dedicated ‘Leadership’ and ‘One to Watch’ honours, four team and two student titles. Robin Sheppard, Chairman of Bespoke Hotels, was awarded the coveted Leadership title. The classically trained hotelier’s innovative approach to marketing has broadened the customer base of all Bespoke Hotels and led to several other awards and accolades including ‘The RAC Hotel of the Year Award’ and Caterer and Hotelkeeper’s ‘Hotel of the Year Award’, as well as being named amongst Hotel Designs' Brit List 2017, which shortlists the 25 most inspirational and influential hoteliers for the year. The One to Watch honour was secured by Milan Thakrar, Business Development Manager at Historic Royal Palaces, who impressed judges with his enthusiasm and spark for the industry as well as his approach to engaging with booking agents and implementing social media strategy. 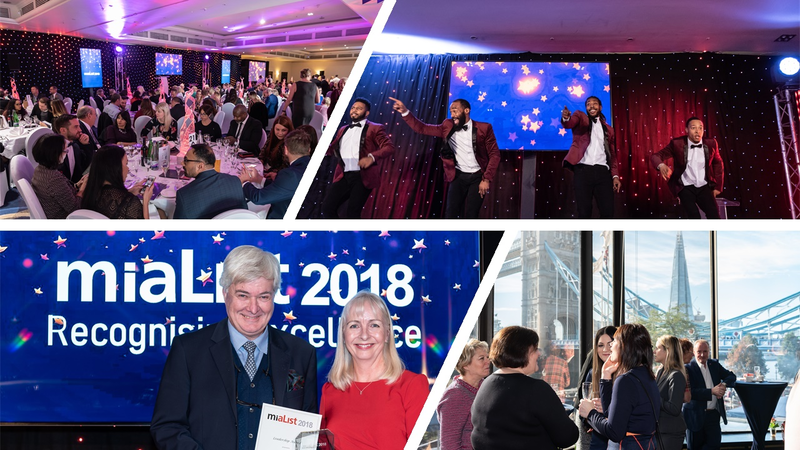 Sponsored by Core Process, this year the miaList has four team award categories – Meetings & Events Venues; Bookers, Suppliers and Consultants; Conference Centres; as well as Academic Venues. With a shortlist of teams presented by the mia it was down to industry peers to vote for which team took home each title. From a shortlist of six for the Meetings & Events Venue title was awarded to The Grand Brighton. Marketing agency Patch Media was named the Bookers, Suppliers and Consultants winner, while the NEC scooped the Conference Centre title and College Court Conference Centre & Hotel was voted winner of the Academic Venues award. Judges voted Cariad Williams from the University of East London for the Graduate award and Rhys Gillard from Leeds Beckett University for the Post-Graduate accolade after performing at a level above their contemporaries and displaying exceptional understanding of the industry. The miaList judging panel represented all sectors of the event industry – buyers, agents and venues – and included: Rob Flinter of Park Plaza Victoria, Lacy Curtis-Ward of The Lensbury, Gill Smillie of Conference Venues Countrywide, Carol Primett of Anglian Water, Amanda Thurlow of ACCA, Richard O'Riordan of Tower Hotel London, Robert Kenward of YOU search & select and Mark Gallen of MG Sales Performance. The miaList winners were revealed at a prestigious ceremony on Friday, 2 November at The Tower Hotel, London.